As soon as I saw the colors for the Color Challenge over at Splitcoast today…I pictured a night scene with geese. The required colors are SU! Night of Navy, SU! Perfect Plum, white and for dessert…sparkle! Here’s how it’s made. I cut a 1″ circle with Eclipse Masking Tape and placed it on my background. After that, another piece of Eclipse was ripped and placed across the bottom of my card for the snow. Next, I did an emboss resist with the template. Haven’t done an emboss resist? The template was placed on my card stock and it was inked with embossing ink. I made sure to push lots of embossing ink into the little birds. Then, I lifted off the template and heat embossed it with clear embossing powder. Next, the sky was sponged with both the plum and navy inks. Once that was done, I used some paper towel to remove any traces of ink from the birds. Since half of the large bird over the moon didn’t show up, I placed my template back over the moon and lightly inked the upper half of the bird with the navy ink so it showed up. 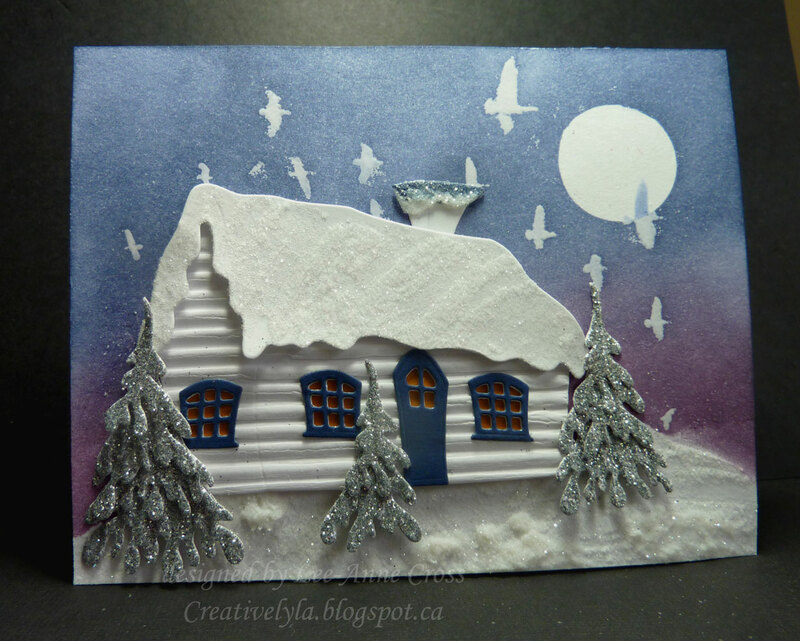 Next, I cut out my winter cottage, using fluted paper for the main part of the cottage and smooth card stock for the rest. The windows and door are die cut in the navy, as is the top of the chimney. I placed a piece of More Mustard card stock behind the windows and doors. Then the roof, snowy ground and top part of the chimney were coated in glue, kind of mimicking snow and snow drifts and then I added glitter to all three. The trees are cut in fluted silver glitter paper…gives them a really cool look don’t you think? When I put the scene together I used dimensionals under the roof for a little more interest. I chose not to put a sentiment on this…just wanted the scene. Back soon with more my dear friends! Thanks for joining me today! Love your house and the wonderful winter scene you created!! Fantastic scene with amazing texture Lee-Anne! Gorgeous sky too!